Our next meeting will be on Monday, November 24, 2014 at 6:30pm at the Rapides Westside Library in Alexandria. The public is welcome, so bring a guest if you can. 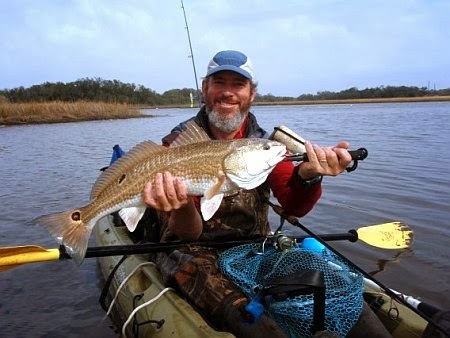 Our special guest speaker will be LDWF regional biologist Rickey Moses who will talk about area fisheries, including results of their recent surveys. Here's a golden opportunity to learn where the fish are! Also on the agenda: fishing reports, update on the Cenla Fly Fishing Festival, and updates on proposed club trips. Our next fly tying session will take place on Tuesday, November 18, at the Rapides Westside Library in Alexandria. Time is 6:30pm. The public is invited. The pattern this month will be the Estaz Charlie. Bob Nauheim's Crazy Charlie is one of the most effective saltwater flies ever created. In the early 90s, Kyle Moppert and Mike LaFleur each created separate versions of this pattern utilizing estaz for the body (in lieu of transparent ribbing) to give it greater flash and appeal to specks and reds. The popular version used today uses craft fur in the wing instead of kip tail. This is a great wintertime pattern! National Hunting and Fishing Day is a national event celebrated on the fourth Saturday in September. It was established by Congress in 1972 to celebrate the conservation contributions of our nation's hunters and anglers. For over 30 years, Louisiana Department of Wildlife and Fisheries has celebrated NHFD at four venues across the state, including their Woodworth location. Kisatchie Fly Fishers is proud to once again be part of the Cenla NHFD activities. We will doing fly tying demos, hands-on tying, hands-on fly casting, hands-on knot tying, and talking about fly fishing, including opportunities in the Cenla area, on the coast, and beyond. Our next meeting will be on Monday, September 22, 2014. Please note a change of time and location for this meeting... we will meet starting at 6:00 pm at the park on Lake Buhlow in Pineville (off Highway 165). The public is welcome. This meeting will be dedicated to casting practice and instruction. Bring your fly outfit (rod, reel, line) that you wish to improve your casting with. You might even want to bring a few flies as there are bass and redears that frequent the banks near the park area. If you don't have a rod, or can't bring one, you can use one of the club rods during this meeting. We're starting a half-hour earlier to get in as much daylight - and casting - as possible. A cool front is expected to move through the night before, so it should be comfortable. In addition, having a nice breeze to cast into makes for a more realistic learning experience (the wind ALWAYS blows when fishing). If you can't make it as early as 6:00pm, just come when you can. We'll gather around 7:30pm to go over a few club items including this Saturday's Cenla National Hunting and Fishing Day to take place at the LDWF Environmental Center in Woodworth. This event is free and open to the public. The Fair features free casting lessons, free tying lessons, free beginner classes, tying demonstrations, and free classes. Class size is limited, so registration is strongly suggested as some classes will fill up early. On Friday during the day, there will be workshops, including Continuing Education for IFFF Certified Casting Instructors (CCIs). On Friday evening, there will be a Jambalaya Buffet, followed by Awards and a Live Auction at the Ocean Springs Yacht Club, 100 Front Beach Drive. The Auction will feature fly tackle, guided trips, artwork, fly plates, and much more! Half of the proceeds will be donated to the University of Southern Mississippi - Gulf Coast Research Lab, which is responsible for a number of projects in conjunction with the Gulf Coast Council. Saturday is a day full of activities, including casting, tying, vendors, exhibitors, workshops, raffles, and much, much more. The list of casting instructors is impressive, with a number of IFFF Certified Casting Instructors (CCIs) as well as Master Certified Instructors (MCIs). Our next meeting will be on Monday, August 25, 2014 at 6:30pm at the Rapides Westside Library in Alexandria. The public is welcome, so bring a guest if you can. As of this posting, our scheduled speaker was not able to confirm. If they are unable to show up, we'll see a video by Lefty Kreh on fly casting. Lefty is the dean of fly fishers... his video contains numerous tips to help improve your casting. Also on the agenda: upcoming events, our participation at the Cenla Hunting and Fishing Day (September 27), update on the Cenla Fly Tying Festival now set for January 24th, and proposed trips to Calcasieu for reds and specks (fall) and to the Lower Mountain Fork (winter). FREE ADMISSION. Open to the public! Fly Tying, Casting Demos, Lure Exhibits, Auctions / Raffles, Food and Refreshments, Equipment Displays and more! Public invited. Our next fly tying session will take place on Tuesday, August 19, at the Rapides Westside Library in Alexandria. Time is 6:30pm. Guests are invited. The pattern this month will be the foam spider. This is a great pattern for late summer fishing on all area lakes, especially around docks and trees. It's relatively simple to tie as well. Bring your tools if you have some, materials will be provided. For those without tools, good news! The club tying sets have arrived. We now have 3 sets of the following: vise, bobbin, scissors, bodkin, hair stacker, hackle pliers. 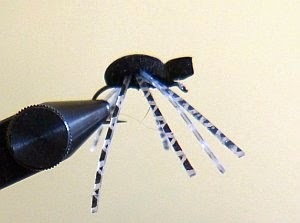 These are for use only during tying sessions. Our next meeting will be on Tuesday, July 22nd at 6:30pm at the Rapides Westside Library in Alexandria. Please note the change from our routine 4th Monday date. The topic of this meeting will be "What Knot to Wear". I'm knot kidding. We'll do hands-on of several popular fishing knots. Also, if anyone has any knots they'd like to share, please do so. The public is welcome, so bring a guest if you can. Also on the agenda: upcoming events, our participation at the Cenla Hunting and Fishing Day (September 27), and a proposed "Cenla Fly Tying Festival" for January. See you there. The next monthly meeting of the Kisatchie Fly Fishers will be on Monday, June 23rd at 6:30pm at the Rapides Westside Library in Alexandria. The public is welcome, so bring a guest if you can. For this meeting, we welcome Ms. Kristi Butler, Manager for Booker Fowler Fish Hatchery, as our guest speaker. 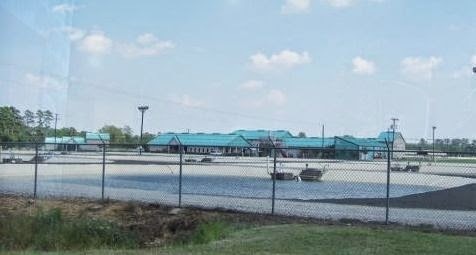 The LDWF Booker Fowler Hatchery is located in Woodworth and is the primary fish production for the state. Kristi will talk about the workings of the hatchery and stocking efforts in the Cenla region. Please make sure to arrive early for this meeting as Kristi will give her program first. We will then follow later with club news, fishing reports and other business. 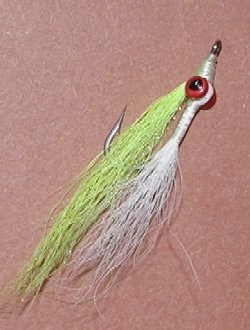 Our next fly tying session will be on Monday, June 16th, at the Rapides Westside Library in Alexandria. Time is 6:30pm. Beginners are invited. This month, we'll review some basics on fly tying with a video by Gary Borger. Then apply those basics for one of the most effective freshwater patterns ever created... but with a slight twist. Members are encouraged to bring their tools and follow along. Materials will be provided. For those without tools, we have a few to borrow for this session (KFF is getting four sets of tools that should arrive for our July session). The Texas Council of the International Federation of Fly Fishers (IFFF) will hold their first-ever Expo Friday-Saturday, June 12-14, at the Civic Center in New Braunfels, Texas. The title of their event is "Destination Texas Fly Fishing Expo" with the intent to feature fly fishing opportunities in Texas, as well as flies and techniques for all fish, all waters. Admission is $20 for both days. The Civic Center will feature exhibitors, vendors, programs, and fly tying demonstrations by some of the country's top fly tiers. Cypress Bend Park will be the location for Casting Programs, Certifications, and kayak fishing classes. Both locations will have hands-on workshops, which attendees can sign up for a nominal fee, and with limited class sizes. Also Youth and Women's Outreach programs. Natchitoches Fishing Expo this Saturday! The 2nd Annual Natchitoches Fishing Expo - a celebration of Light Tackle and Fly Fishing - will be held this Saturday, May 3, 2014 at the NSU Prather Coliseum in Natchitoches, LA. Time is 8:30 am to 5:00 pm. Admission is FREE! Hosted by the Cane Country Fly Casters, there's activities for the whole family, including kids casting games hosted by professional bass angler Kat Arnold. Also over 50 vendors and exhibitors, 50+ fly tiers from across the South, programs on all types of fishing (bass, crappie, kayaking, fly fishing, fish biology and more) as well as activities for the non-fishing spouses. Silent auction and raffles with many one-of-a-kind items to raise money for our charities. Lots of great local restaurants and places to visit in the Natchitoches area. For a complete list of activities and programs, and links to Natchitoches area info, go to www.canecountry.blogspot.com. 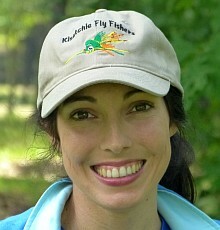 The next meeting of the Kisatchie Fly Fishers will be on Monday, April 28. Location is the Rapides Westside Library on 5416 Province Place in Alexandria, in the north meeting room. Time is 6:30pm. This meeting is open to the public, and all are invited. For April, we will review some of the basic priniciples of fly casting, followed by a video by Mel Kreiger on "Casting Faults and Fixes". Mel was considered one of the best casting instructors of all time, and this video is both entertaining and educational. Also on the agenda: some great fishing reports... bream action is starting to heat up as we approach the full moon in May. Also details on this Saturday's Natchitoches Fishing Expo - a celebration of light tackle and fly fishing at Prather Coliseum on the campus of NSU and hosted by our sister club Cane Country Fly Casters of Natchitoches. See you there! 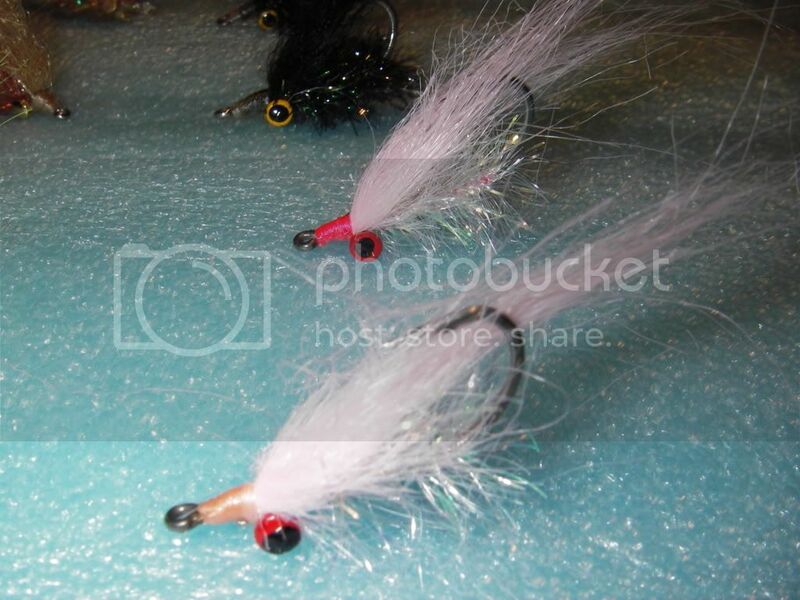 Ideal Warm Water Flies for bass and pan fish. Make plans now for Expo! March 24 meeting - Meet the Fluff Butts! The next meeting of the Kisatchie Fly Fishers will be on Monday, March 24. Location is the Rapides Westside Library on 5416 Province Place in Alexandria, in the north meeting room. Time is 6:30pm. This meeting is open to the public, and all are invited. Catch Cormier will give a presentation on "Fluff Butts and How To Fish Them". There are numerous variations of this fly, but one thing they have in common is an ability to catch fish when used correctly. It's caught everything from bluegills to stripers, and a saltwater version has even taken speckled trout and snook! Catch will also briefly discuss other hot panfish flies such as Jitterbee, Cap Spider, Tussel Bug, and more as we prepare for what should be a great spring fishing in the Cenla area. For a schedule of activities, bio on speakers and tiers, and other details, go to www.acadianaflyrodders.com and click on "Club News". The next meeting of the Kisatchie Fly Fishers will be on Monday, January 27. Location is the Rapides Westside Library on 5416 Province Place in Alexandria, in the north meeting room. Time is 6:30pm. This meeting is open to the public, and all are invited. For January, we are delighted to have Mr. Jeff Guerin as our guest speaker. Jeff is a fly fishing guide on the Little Missouri River in southwest Arkansas, and owner of the www.littlemissouriflyfishing.com website. He's also an accomplished blues musician. The Little Missouri River is located near Murfreesboro, AR, exactly four hours from Alexandria. 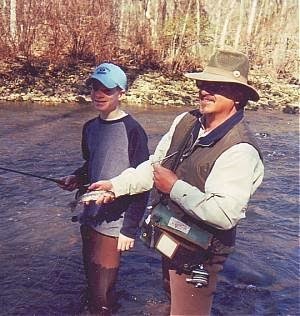 It is one of three tailwaters in the Ouachita Mountains that are cold enough to support rainbow trout year-round. In addition, there is a winter-only stocking of trout in the river section above Lake Greeson. Jeff will talk about the history and future of trout on the river, about tackle, flies, and tactics for trout, and other fly fishing opportunities in the Ouachitas. Jeff is always fun to listen to, and this promises to be a very informative meeting... you will not want to miss!